Gorgeous vibrant peacock blue 6 strap suspender belt made in a lightweight Nylon/Lycra mix which is soft and comfortable to wear and made with plain panels that offer a smooth line under clothing. Designed with a vintage look in mind with deep panels and a waistband that sits high on the waist, but with modern materials to ensure comfort and fit. 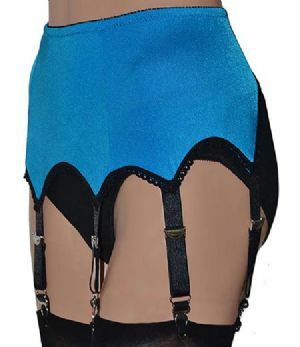 There are 6 adjustable 19mm wide suspender straps with hypo-allergenic metal clips, ensuring that stockings stay exactly where they should be. Finished off with a black lace trim around the bottom and black suspender straps.